Canada's Amazon store has an extremely limited selection in comparison to our American neighbours. Luckily, there are ways to sidestep the Canadian store's limitations. I live a mere 20 kilometers from the Canadian/American border and I often ship products to a depot on the American side. This can save money on shipping and on general purchase prices. It also affords the opportunity to take advantage of that incredibly large American Amazon selection. About a month ago, I found a few packs of America the Beautiful and had them shipped to the American depot for pickup. Picking up packages at this depot can often be an adventure. However, one of the best advantages is that a single person can pick up packages for many different people, as long as they have an invoice to show the purchase of the product. 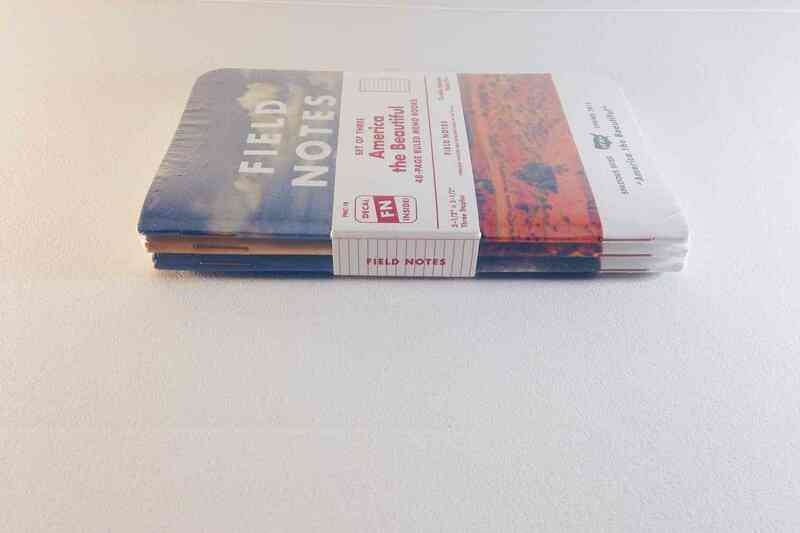 My boss's wife heads down to the shipping depot a couple times a month and she graciously picked up my Field Notes packs to save me the time and gas. I've shown my boss all my different COLORS editions1 and he has never been fully interested. This time however, when I arrived at the office on a Saturday morning, my boss had seen the packages his wife had picked up and he excitedly showed off my delivery. America the Beautiful hearkened to something different for my boss. He grew up on a farm and remembered watching his father and grandfather record all sorts of information in their small agricultural memo books. He even remembered reading through those books from time to time to learn about weather patterns and crop rotations. America the Beautiful brought back all those memories for him. I was taken aback at the impact this COLORS edition had had on my boss. Maybe that nostalgic imprint has swayed my opinion of this COLORS edition. Maybe America's general theme has impacted me personally. Either way, I love America the Beautiful. It is easily my favourite COLORS edition to date. And I don't understand how they are not yet sold out. 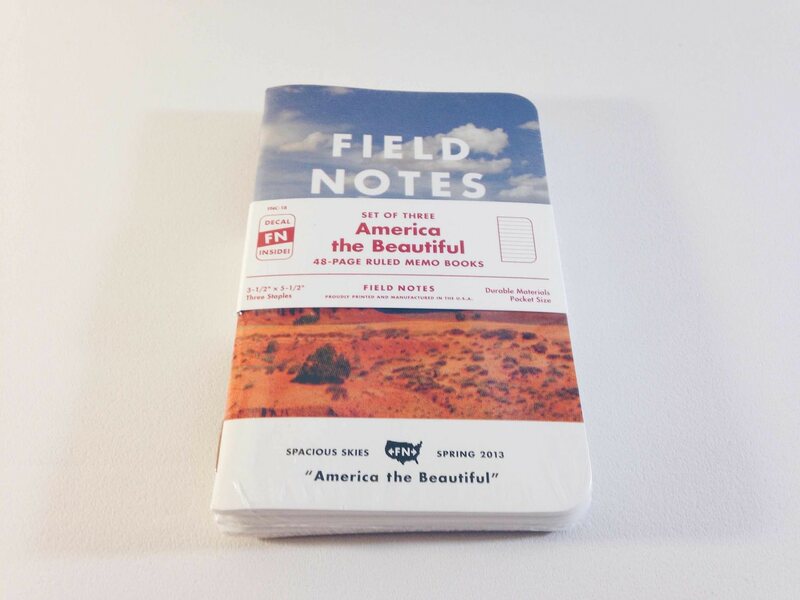 America the Beautiful, Field Notes Brand's 18th COLORS edition, stepped away from many standard manufacturing processes previously entrenched in the COLORS line. 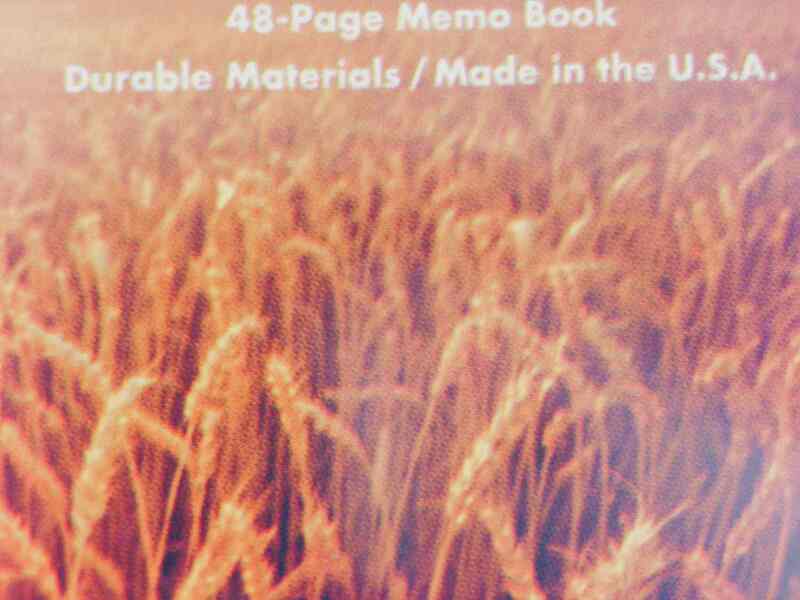 America's covers are made of a different material than kraft Field Notes books, America's innard paper is a heavier weight than kraft Field Notes books, and America's innard paper ruling is different than kraft Field Notes books. 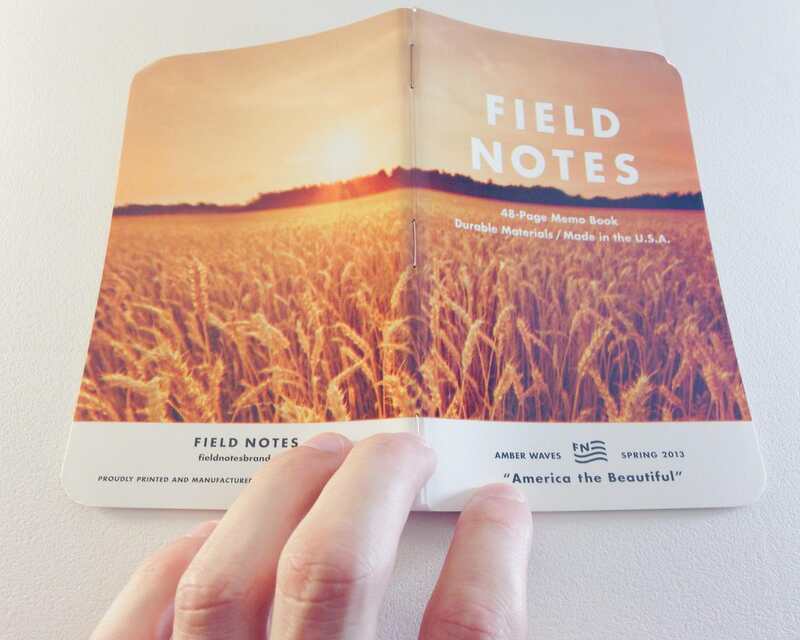 In effect, America was one of Field Notes Brand's biggest deviations from the standard COLORS course. 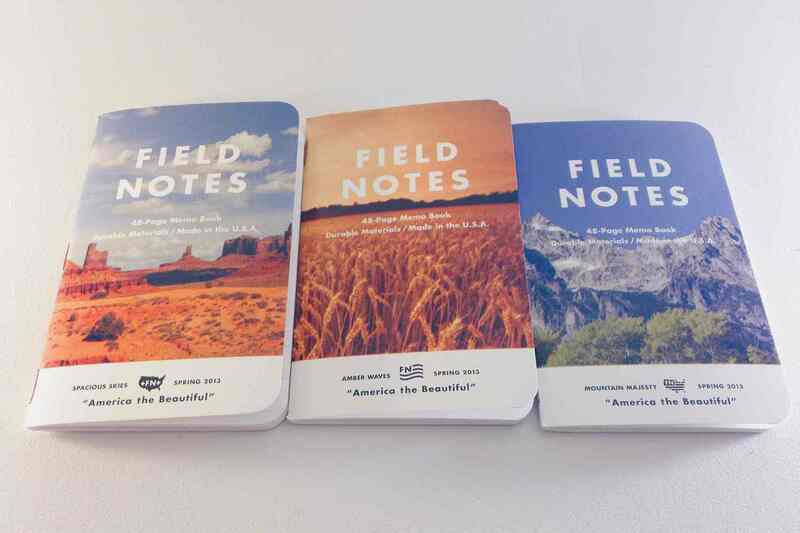 But Field Notes Brand didn't buck tradition entirely with America. In fact, tradition is America's name of the game. And America truly is beautiful. America's traditional theme begins with its three different front and back covers. The covers are made of Mead Westvaco Tango blanks that are thicker than the standard 80#C French Dur-O-Tone found in kraft Field Notes books. I would even venture to say the covers feel thicker than the French Construction 100#C covers found in Pitch Black editions. The photos used on those thicker covers are purposely printed slightly off-kilter to give a blurry and nostalgic impression. From afar, it's hard to notice the difference, but the 100-line screen print makes America's cover photos true to its theme. 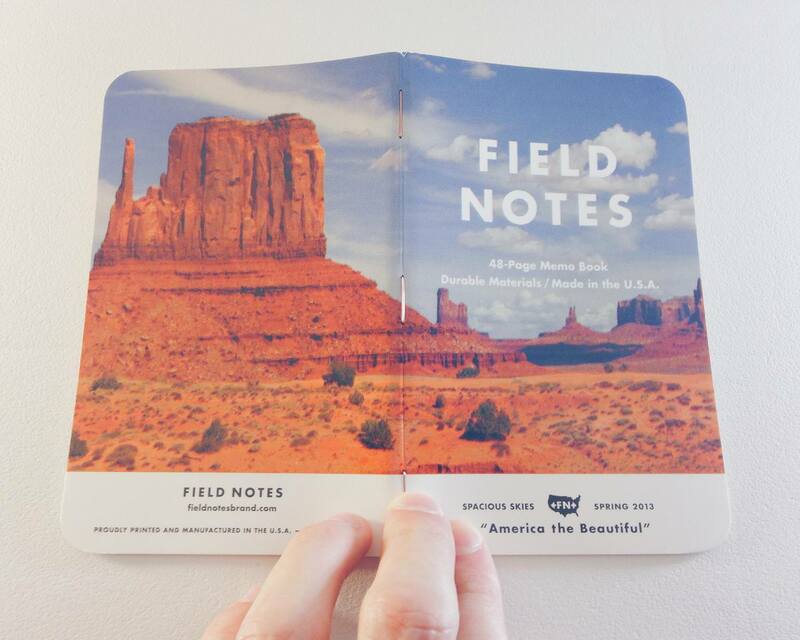 To top off America's nostalgic construction, Field Notes Brand used a copper staple to bind the book. 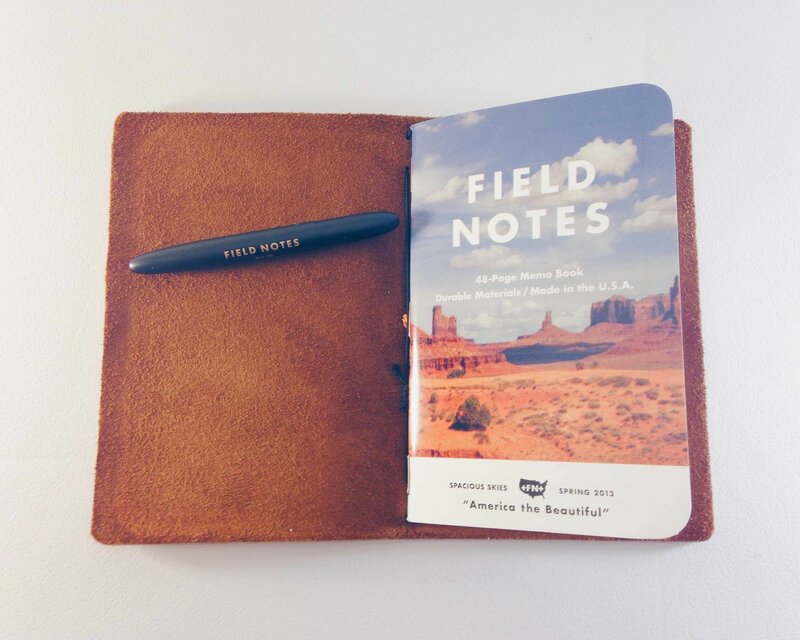 Again, staying true to the Field Notes Brand name, every detail remains accounted for and the copper staple is just the icing on the cake. Each photo is a full cover rendition of three great landscapes found across the United States. “Spacious Skies”, “Amber Waves” and “Mountain Majesty” are printed across America's front and back covers to give a full 7" by 11" photo when opened flat. I believe these nostalgic 1960 photos are what struck my boss so close to heart; a rendition of an artifact from the past always hits an intimate nerve upon first sight years later. I think these photos add a human element to America which I don't believe is evident in any other edition I've reviewed. America's innards are another step away from tradition. Instead of the 50#T Finch paper found in kraft books, America is packed with a heavier 70#T stock. 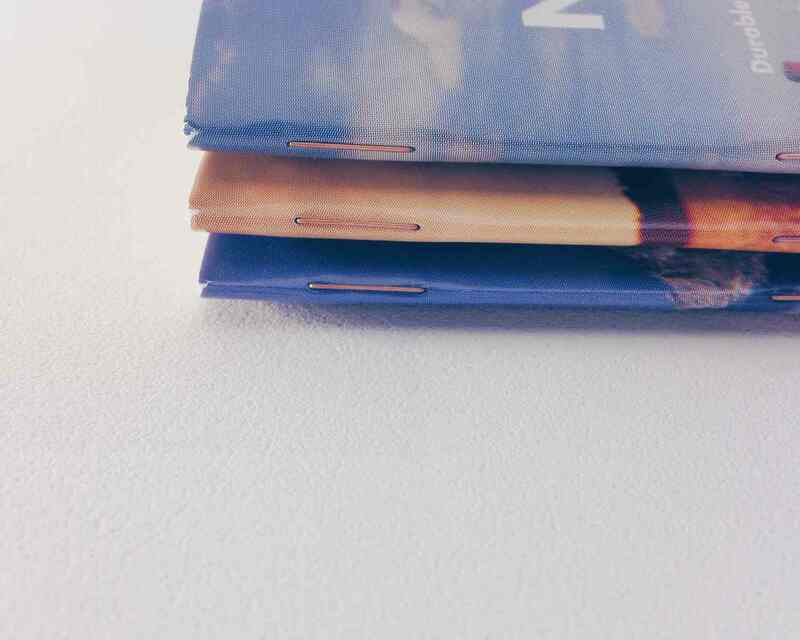 The paper is noticeably thicker and heavier, resulting in a thicker and sturdier book. The 70#T Finch paper is a “Soft White” colour that is much easier on the eyes than the Bright White paper found in kraft or Pitch Black versions. 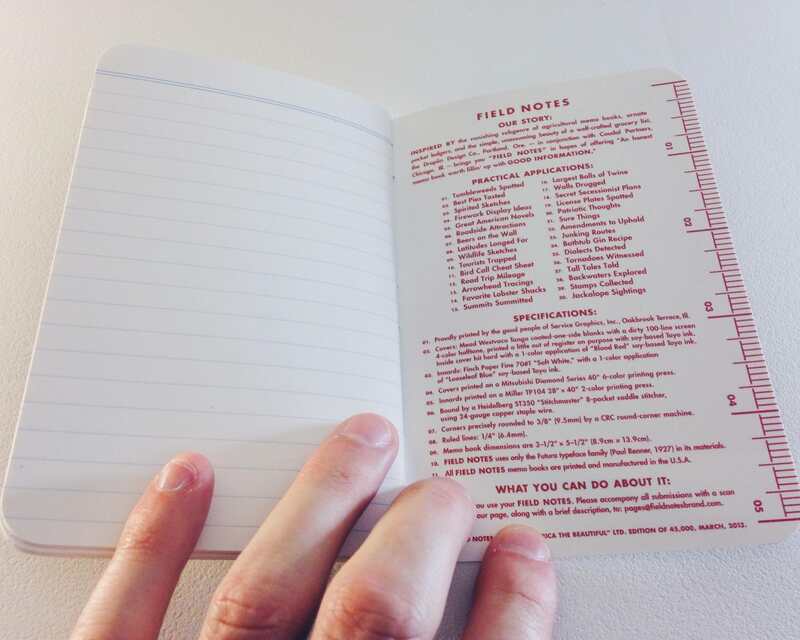 Between the Soft White colour and the heavier stock, America's innards are more reminiscent of higher quality Moleskine paper than of traditional kraft Field Notes paper. And this is a great thing. By this point, there are many reviews online showcasing how the heavier stock paper handles different types of pens. Inkonhand.com outlines how the 70 lb. paper handles fountain pens. Overall, the 70 lb. paper appears to work extremely well with ballpoints, rollerballs and pencils, but fountain pens experience a high level of bleeding and feathering. I have yet to try out a fountain pen, so I can't determine the validity of this test. However, with the ballpoints and rollerballs I've tried, I have no reason to complain. I love America's classic “Looseleaf Blue” ruling. It's the colour I remember when sitting down in a third grade handwriting class to perfect my uppercase “S”. As the large cover photos were to my boss, so too was the Looseleaf Blue to me. But that line-height. 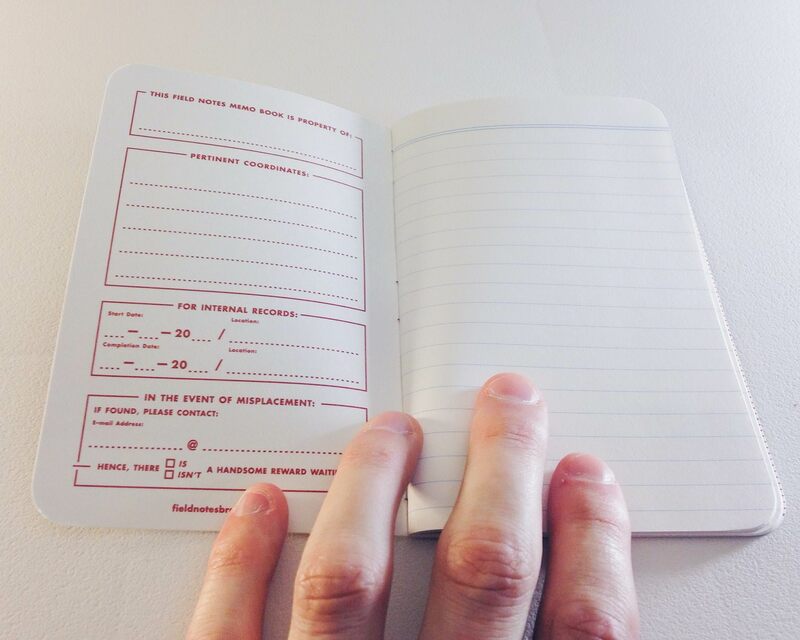 All previous Field Notes books were printed with full grids or dot grids2 that used 3/16" squares. I'm sure the smaller grids forced people to shrink their writing to adhere to the guidelines. Not only did the smaller grid force me to write smaller, it allowed me to write more on one page. The more lines on a page, the more I can write down on a single page. Simple. However, America introduced a ¼" ruling. I never knew 1/16 of an inch could cause so many problems. The rulings are surprisingly bigger, forcing that condensed form of handwriting into something larger. And, since the books remain a 3 ½" by 5 ½", there are less lines on a page. Generally, I work my way through a 3/16" full/dot grid book in about three weeks to a month. With the thicker rulings, I'm 12 pages into the book after 4 days. At that pace, I'll complete a book every two and a half weeks. 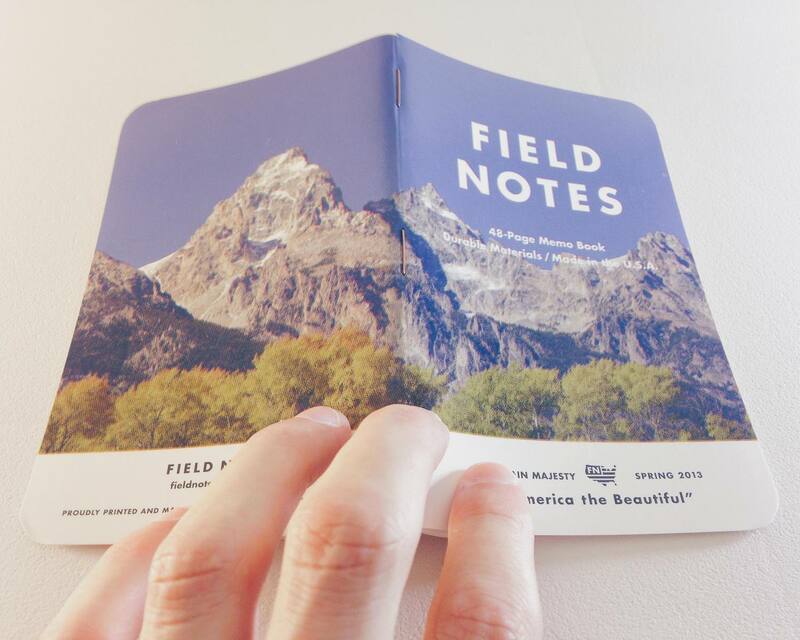 If Field Notes Brand wants my money, they'll begin releasing every COLORS edition with ¼" ruling. I'll eat through my books faster and I'll buy more. But as a consumer, I'm not overly happy with that ruling. Lastly, America's inside covers are one for the ages. I've mentioned in the past how I like inside covers that allow easy documentation of each book. 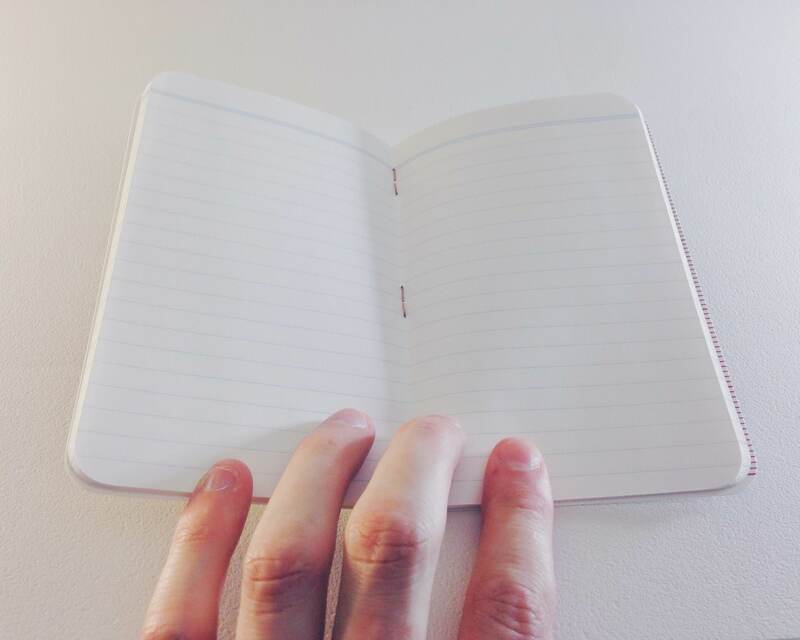 I prefer books that have a light coloured inside cover that writes smoothly without smudging. America strikes the perfect balance between visual design, adherence to a theme, and proper useability. If it were up to me, every inside cover would be printed like America. Have I made it pretty clear that I love America the Beautiful? Everything about the Spring 2013 COLORS release tickles my fancy. America embraces a thicker, tougher cover that should wear through some heavy use. Its inside covers are magnificent, staying within America's traditional theme yet remaining completely useable. Its staples hearken back to a bygone era where the amber-red copper colour was prevalent. America's innard paper is of a heavier stock that writes especially well with ball point pens. And, although my least favourite aspect, America's Looseleaf Blue ruling deviation remains within the nostalgic theme and is sure to rekindle images from the past. Honestly, the only thing I don't like is America's line-height. And that's borderline nit-picking. America the Beautiful was designed with the 1960s in mind. The covers are printed off-register on purpose to create a blurry front image and the image's initial impression is maintained throughout the book. Everything in this book screams nostalgia. And that fits me — and my boss — perfectly. I couldn't be happier with this COLORS release. I just need to find a way to get my hands on more of them.